Top staff members at Cambodia’s largest human rights organizations are reporting intensifying levels of harassment, surveillance, intimidation and threats, describing pervasive and unprecedented pressure nationwide ahead of next year’s national election. 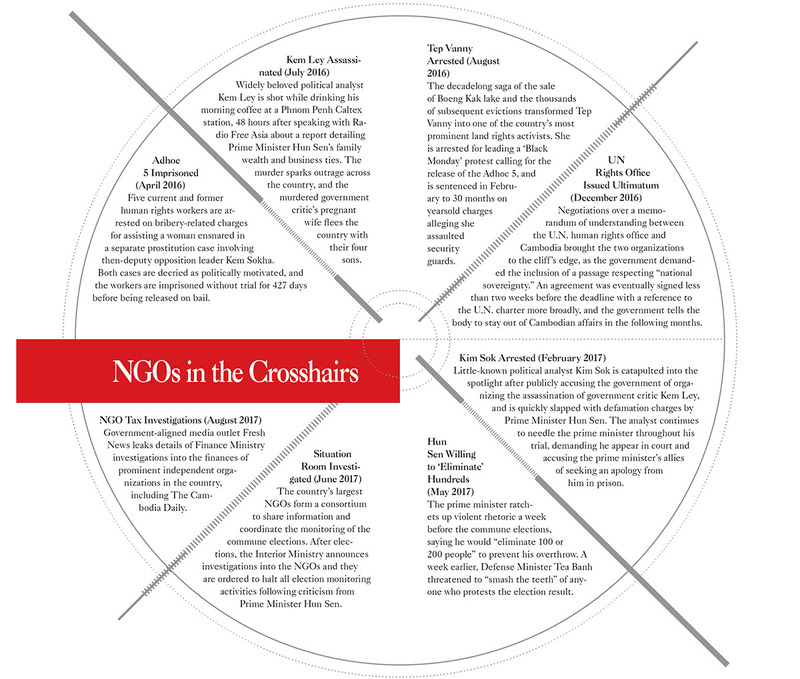 NGO leaders recount constant surveillance of top staff, harassment of family members and friends, personal threats leveled at employees, and the consistent disruption or termination of events by armed guards or police. They say anonymous and official warnings, which threaten arrest or harm, typically in a vague but menacing way, permeate their work and jar their everyday lives. “It’s on a day-to-day basis. And they don’t just phone or record the movements, but they will follow the key staff to their homes, to their work, even on mundane family trips,” said Naly Pilorge, deputy director for advocacy at Licadho, one of the country’s oldest and largest rights NGOs. Surveillance is ubiquitous and “during events, we always expect it,” Ms. Pilorge said. Licadho’s offices—where staff carry out research and legal advocacy for political prisoners, legally embattled human rights activists and villagers involved in disputes over land grabbing—are regularly watched, she said. The same is true for housing and land rights group Sahmakum Teang Tnaut, which focuses on the urban poor, according to executive director Soeung Saran. “Wherever we go, we know we are followed,” Mr. Saran said. Eang Vuthy, executive director of another land rights group, Equitable Cambodia, also reported key staff being followed from training sites to their Phnom Penh offices. He said the situation was even worse outside the capital. “Now it’s very difficult to work on the ground, because they just follow everywhere,” he said. Ms. Pilorge said two of Licadho’s senior staff members have been followed on a near-constant basis since just before the commune elections in June, an escalation of more sporadic and irregular surveillance that has occurred since 2013. She declined to identify the staff members or their roles in the organization, for fear of drawing even more negative attention. Rights groups willing to speak about the situation say the intimidation is intensifying ahead of next July’s high-stakes national election, a contest the opposition believes it has a serious chance of winning, thereby toppling the ruling CPP and its vast patronage network. 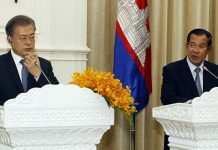 While groups reported sporadic surveillance in the past, they say it accelerated after the previous national election in 2013, when the opposition—newly united under the banner of the CNRP—presented the most significant challenge to Prime Minister Hun Sen’s rule since he consolidated power in bloody factional fighting in 1997. The CNRP lost that ballot in what it claims was a rigged vote, but has managed to survive another election cycle, again outperforming previous showings in the June commune elections. In December, a team from the center accompanied three filmmakers to Pursat province for field work. 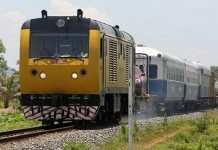 After visiting several communities, they headed back to Phnom Penh, but were quickly stopped before leaving the province. Guards of some kind—the rights officers were unsure if they were state or private security—stopped the team on the road. While not arrested, they were prevented from moving down the road by a checkpoint. The NGO’s headquarters quickly issued a media alert and rang around to local community members to seek help in dealing with the authorities. Community members arrived and assisted in securing the release of the rights workers, who continued on to the capital unmolested. There was a sense that the situation could have been much worse. “Fortunately, those active community members could help us go out from the checkpoint,” Mr. Piseth said. The center now suspects the team had been followed from the start, he added. Preap Kol, executive director of Transparency International Cambodia, a high-profile anti-corruption NGO, said organizations cannot use “benchmarks for the last 20 years” to analyze the current risk. When conducting interviews, Mr. Kol puts his mobile phone into airplane mode, saying friends who work at the telephone company confirm that his smartphone is being monitored. While it may sound like paranoia, accounts of surveillance are extensive and stretch well beyond electronic snooping. Mr. Kol said he is regularly followed when he leaves the office, and will abruptly change meeting locations or meet people in his car to avoid his minders, who rotate every few months to avoid being identified. “I often spot people sitting nearby, listening very attentively, with recording devices,” he said. Rights workers are hesitant to directly assign responsibility for the surveillance they’ve observed, worried by a slew of defamation cases that have been leveled by ruling party politicians against political analysts and opposition members. Any government surveillance would likely run through the Interior Ministry, which manages the country’s police and civilian security services. Spokesman Khieu Sopheak, however, denied the ministry was carrying out any surveillance of NGOs. There is “no surveillance…of NGO activity, or members of staff,” General Sopheak said on Monday. Representatives of civil society say the surveillance is meant to intimidate them. And in the context of events over the past two years, they say it is a reminder that the suppression of freedoms can be taken to extremes in Cambodia. In May last year, five current and former employees of human rights group Adhoc—which, alongside Licadho, is one of the country’s most entrenched and well-regarded NGOs—were charged for bribery-related crimes after they allegedly helped a woman caught up in court action involving a senior opposition politician, now CNRP President Kem Sokha. The case, which saw the government’s anticorruption and counterterrorism units spring into action over an alleged extramarital affair, was widely considered an unjustified use of the judiciary to harass the ruling party’s opponents. The rights workers, dubbed the Adhoc 5, were jailed for over a year without trial, sending chills through civil society. And in July last year, popular political analyst Kem Ley was shot dead in broad daylight while drinking coffee at a gas station in Phnom Penh. The CPP has denied it orchestrated the hit on Kem Ley, and has swiftly countered accusations of involvement with defamation charges. The Phnom Penh offices of the country’s most prominent rights groups bear the signs of such threats. Many still display banners seeking the release of the Adhoc 5, who each spent 427 days in prison before their release on bail in June. They are set to face trial at a later date. The meeting room at the Cambodian Center for Human Rights has posted signs banning mobile phones to prevent unwanted recording, and their advocacy director, Duch Piseth, said the organization’s employees assume their electronic communication is being monitored. Civil society in Cambodia, especially human rights organizations, are now facing more threats, Mr. Piseth said. In addition to surveillance, several rights workers reported threats or intimidation, often passed along through third parties who claimed to have heard the warning in a meeting with government officials. These threats are often vague, but take on a sinister edge when considered in the context of Kem Ley and the Adhoc 5. Mr. Vuthy, of Equitable Cambodia, told reporters he had received warnings to “slow down,” passed along by NGO partners and originating from unspecified Interior Ministry officials. “Somehow, the information gets to the people that I know, and then it gets to me,” he said. Ms. Pilorge reported a similar method of warnings being conveyed through intermediaries, and like Mr. Vuthy, she understood them to be threats. Sometimes the threats extend beyond the NGOs themselves. Ms. Pilorge said family members of some key Licadho staff had been approached by plainclothes security officers, who asked where the staff member was, what they were doing and when they would return. She also reported plainclothes security showing weapons to intimidate the targets of their surveillance. The surveillance “is not just to record or inform about movement, but it’s also to intimidate, create fear, traumatize key staff,” she said. Thun Saray, president of Adhoc, who went on an extended mission to Canada after his employees’ arrest, said in addition to the jailings, some of his staff had been accused of bias in their work, which could have legal consequences in light of a widely condemned new NGO law that demands political neutrality. “Some other staffs of my organization…they do receive from time to time the verbal accusation from officials that we work for the opposition,” he said. Threats are often delivered directly to their intended recipient. Mr. Kol, of Transparency International Cambodia, said his Facebook inbox gets inundated with dozens of threats, both anonymous and from people with ties to the ruling party, following the publication of reports critical of government corruption. “It’s come to the point where I don’t really pay attention to it,” Mr. Kol said. On the other hand, he acknowledged that he has become more careful in recent years on the topics he speaks out about. The uptick in surveillance and threats has taken its toll, both personally and on the organizations themselves, and one expert said surveillance can have devastating effects on an individual’s mental health. Adam Brown, a psychology professor at Sarah Lawrence College in New York who has done research on the mental health of human rights workers, said the rate of post-traumatic stress disorder among rights defenders was about 1 in 5, which was similar to the rates experienced by soldiers returning from war. He ponders how The Cambodia Daily or Phnom Penh Post might cover his death if he were hit by a car. Would they investigate, to look for any suspicious motives? Mr. Kol was with Kem Ley, his good friend, two days before he was shot. They were talking on the radio about a report from Global Witness that detailed the vast wealth of Mr. Hun Sen’s family. Ever since then, Mr. Kol has stopped taking chances with his personal safety. “I don’t want to give any easy spot for me to be vulnerable,” he said. Many viewed Kem Ley’s murder as a return to the not-so-distant past of political killings that plagued the country in the 1990s and early 2000s, and a quick trial and conviction of the suspected shooter failed to quell rumors of ruling party involvement. Oeuth Ang, the shooter, gave his name to authorities as Chuop Samlap, or “Meet Kill,” and both his stated motives—a supposed unpaid debt, even though families of Mr. Ang and Kem Ley deny that the two men knew each other—and video footage of him fleeing the scene, released during the trial, have only raised more questions. Mr. Vuthy, of Equitable Cambodia, also acknowledged that the surveillance and recent events had affected his work, even though he had no plans to slow down. Mr. Kol recently began to pick up on unusual lines of questioning from two young women who had approached him as university graduates wanting to know what he had learned as the head of Transparency International Cambodia. They probed his political affiliations and leanings. At the time he brushed it off, telling them the truth: that he has no political affiliation and doesn’t support any party. But the women were persistent with their political questions, an unusual trait for those he mentored. Mr. Kol said he considers the mentoring of young people as important as his main line of work—pointing out egregious cases of graft as the head of an anti-corruption NGO. The weekly conversations with a variety of interested young people can be fulfilling, he said. But alarm bells went off after several meetings with the women, and Mr. Kol began to investigate further. He found the women were linked to intelligence services. A group of Licadho staff were about to board a bus when they were approached by two men asking to photograph the vehicle. The staff members, who had been followed and watched before, said it was fine. Outside the bus, which was to take them to the hometown of slain political analyst Kem Ley’s hometown in Takeo province, the men proceeded to politely ask where the group was headed. Following the men’s questions, the staff members, who were going to Takeo to pay their respects at the 100-day funeral ceremony for Kem Ley, realized these were surveillance agents, brazenly asking their targets to assist in their information gathering. “Ten years ago, that would not have happened,” said Ms. Pilorge, Licadho’s deputy director of advocacy, who was part of the group boarding the bus. “Those surveillance would have stayed 30 meters away, just phoning and saying, ‘There’s two buses, and I don’t know where they’re heading.’” Some found the bus incident amusing, especially given the respectful demeanor of their watchers. But that’s not usually the case. With key staff members being followed on a near-constant basis and a dozen others saying they have repeatedly been watched, Licadho spoke of the most surveillance of any NGO. Armed guards and police have showed up to the NGO’s training events in the countryside so often that the organization has begun training employees on how to work while being watched by armed authorities, Mr. Vuthy said. Many of the NGO directors hinted at additional threats or intimidation that they weren’t comfortable discussing, and sometimes explicitly said they were holding back out of concerns about personal safety. When these reports are combined with other recent events, it paints a picture of the steady strangulation of civic space in Cambodia. Rights workers are being targeted at the same time that media outlets independent of the ruling party or its close allies are also being squeezed. The Cambodia Daily was hit with a $6 million tax bill from the Finance Ministry this month, while U.S.-government-owned Radio Free Asia and Voice of America—two of the largest Khmer-language outlets critical of the government—are facing questions over their registrations as media outlets. 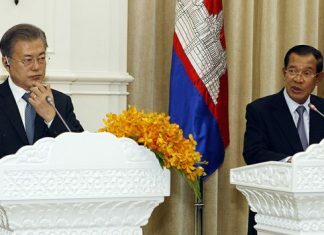 Phil Robertson, deputy Asia director of Human Rights Watch, said the practices described by NGO leaders bring Cambodia into closer alignment with other countries in the region. “Sadly, it’s all too common in just about every ASEAN country for human rights workers and community activists to face regular monitoring and surveillance by government agents,” Mr. Robertson said in an email. He said a unified message from the U.N. and donor countries could go a long way toward protecting rights workers in the country ahead of next year’s election. “Only international pressure that is strongly and consistently applied will work, so donors and Ambassadors need to get ready now,” he said. But with the rise of China as an aid partner and the election of domestically focused Donald Trump as president of the U.S., the standing of international actors pushing a human rights agenda in the country has declined. As voices are silenced and rights defenders are threatened, organizations are adapting to the changing landscape, and some say they are learning and improving along the way. The Cambodian Center for Human Rights, for example, has adopted encrypted email for most of its internal communications. Transparency International Cambodia has received grants to tighten the security of its digital communications. And applications using end-to-end encryption, such as Signal and WhatsApp, have rapidly proliferated in the NGO community. “It’s not just a reaction to the environment, but it’s also a way for the institution to become more professional and grow,” said Ms. Pilorge, of Licadho. Those efforts will likely be more crucial as the political tension in the country ratchets up ahead of next year’s all-important national election. The shared threat means NGOs must recognize and address the surge in intimidation and surveillance, Ms. Pilorge said.